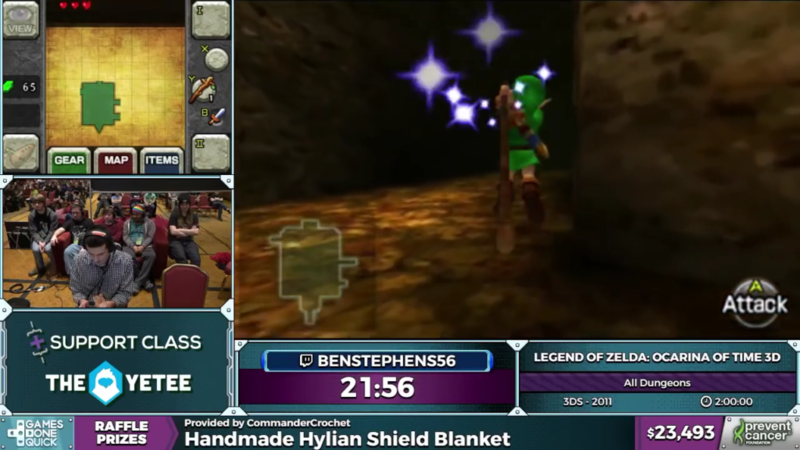 The Legend of Zelda: Ocarina of Time is one of the most popular games in the speed running community. With the release of the 3DS version, speed runners were overjoyed. With each iteration of a game come new exploits and glitches to find, routes to optimize, and much more. 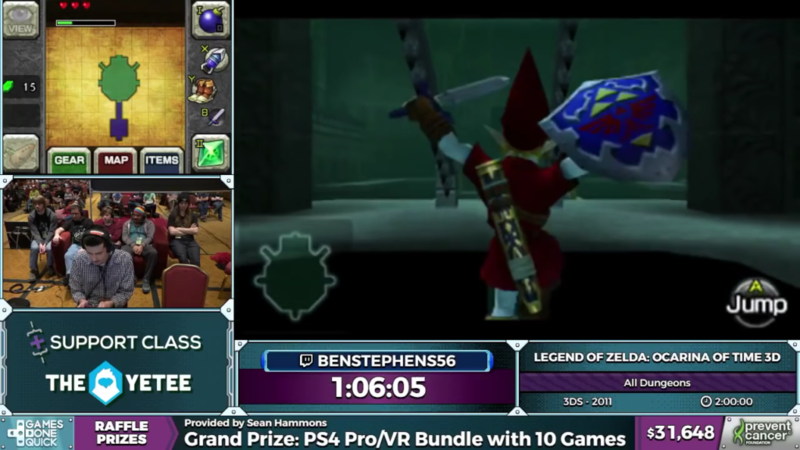 While you might consider Ocarina of Time 3D a simple handheld port, it’s much more than that to the speed running community. Our runner, BenStephens56, seems pretty ecstatic to show that off. Since Ocarina of Time speed runs are often defined by game-breaking glitches, I’ll treat this article like a glitch breakdown. With BenStephens56 ready to go, let’s hope that he can show off some new glitches and techniques! 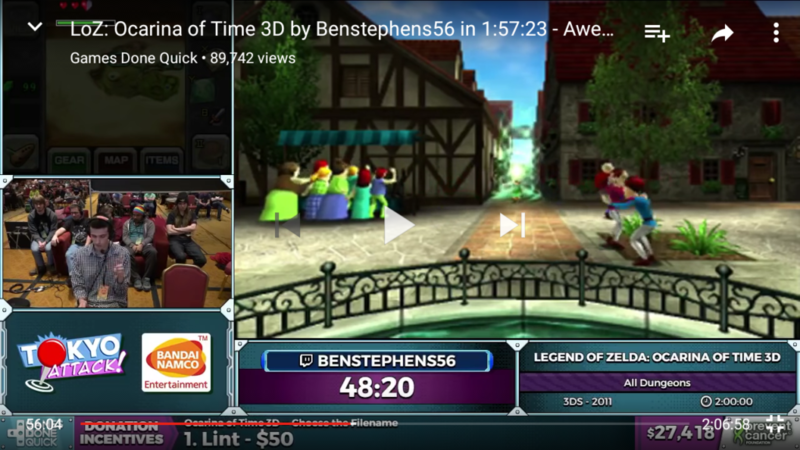 Within the first minute, our runner shows of a 3DS only glitch. As the text boxes pop on screen, there is a one frame window. If you press the B button during that window, the text will scrolls instantaneously. This can save minutes over a run. The first major glitch involves getting out of Kokiri Forest before finishing the Deku Tree. The path is guarded by a fellow villager who will not let you leave until you do so. However, by standing in the corner at the correct angle and slashing your sword three times, you are able to clip past him and exit the forest. This is the first instance of breaking sequence in the run, and can only be done on the 3DS version. After passing through Kakariko Village, BenStephens shows off a movement glitch on the path up to Death Mountain. By taking damage from the spider enemy while holding a specific direction on the analog stick, BenStephens is able to execute a “FESS”, short for Forward Extended Super Slide. This propels Link at a speed well over double the normal maximum. This is a glitch that will appear quite a bit in the run. 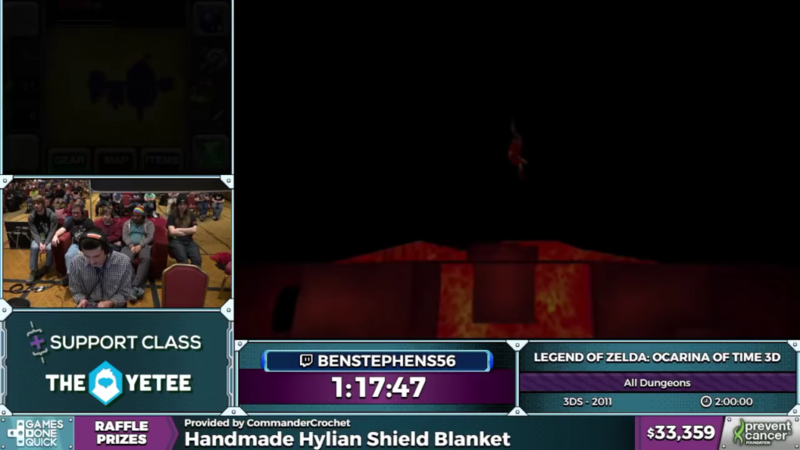 As he enters Dodongo’s Cavern, Ben shows off a cut scene skip. This is executed by leaving the area right as the cut scene loads. While not a difficult trick, it saves time and resets some time cycles to his advantage. He also pulls off a FESS to quicken up traversing a room. The majority of the dungeon is done intentionally, but with one pretty big skip. 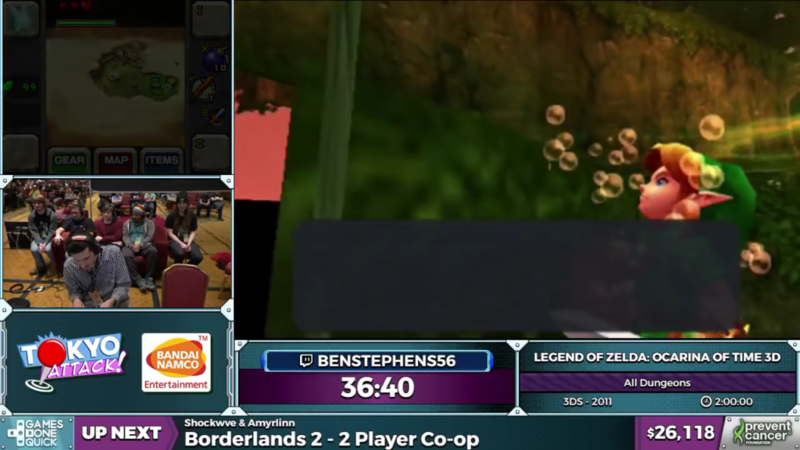 By dying ontop of a switch, Ben is able to skip a block moving puzzle and a series of rooms. This is because the game is forced to reload the dungeon, but thinks that the switch is pushed down by the block (when it’s actually just a dead Link). Once he returns to the room, the exit is open without having to do any of the puzzle. After finishing Dodongo’s Cavern, Ben shows off another kind of ESS slide, this one known as a “HESS” (Hyper Extended Super Slide). It’s the same idea as a FESS, but using a bomb to take damage rather than an enemy. It’s the fastest glitched movement possible in the entire game. In the Lost Woods, we get our first instance of the Navi Dive. Standing near the shortcut to Zora’s River, he activates a Navi conversation after slashing his sword three times. As he does so, he steps back into the water. This triggers the Navi conversation at the same time, which allows him to sink to the bottom of the water without the diving item. He swims through the tunnel and out into Zora’s River. He also completely skips talking to King Zora by the triple slash technique to clip out of bounds, and then swimming underneath him. He also clips into Jabu-Jabu’s Belly using a jump slash at the right angle. Jabu-Jabu is shortened significantly thanks to a huge skip after getting the Boomerang. Using the force of a bomb, Ben executes a long back flip. This allows him to reach the switch to the door early, which he keeps open using a similar glitch to the one saw in Dodongo’s Cavern. It’s really satisfying to see a huge portion of Jabu-Jabu’s Belly skipped; it’s my least favorite of the Child Link dungeons by far. I’m envious of Ben’s skill now, more than ever. After Jabu-Jabu, Ben grabs Farore’s Wind, a magical teleportation spell. Normally, you can use this to travel back and forth from a set point exclusively in dungeons. This will be important in an upcoming trick. 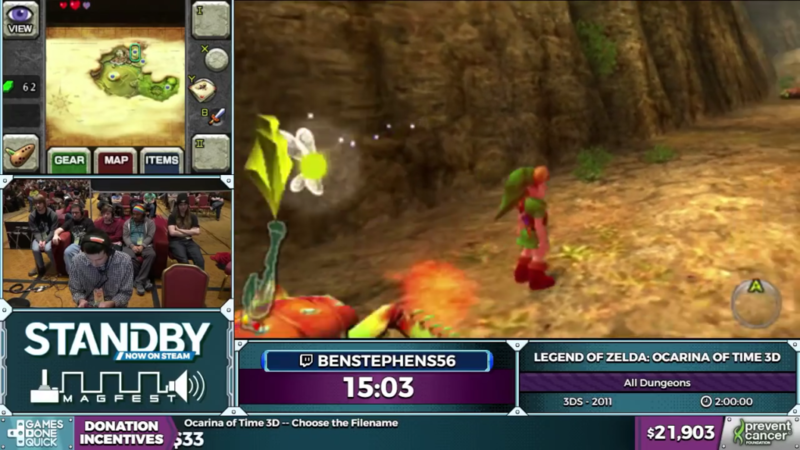 Entering the Market, Ben uses a glitch called “restricted items” that allows him to place Farore’s Wind in the Market. This is done by quickly swapping an available item with the unavailable spell, and attempting to use it. It’s a trick that can only be accomplished on a single frame. As I said previously, you’re not supposed to be able to use this spell outside of dungeons. He then exits the Market and approaches a grotto entrance in Hyrule Field. 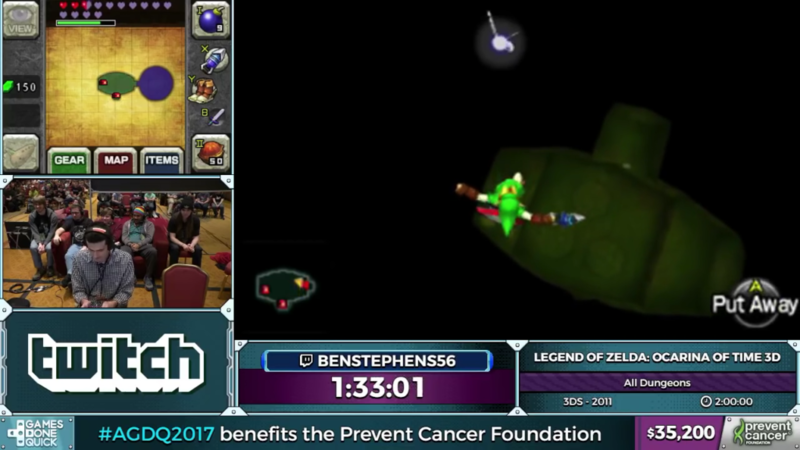 Then, by dying and entering the grotto at the same time, and also saving and quitting the game, Ben manages to freak out the game. At this point, the game is trying to reload the game and the title screen at the same time. This spawns him in the Lakeside Laboratory near Lake Hylia, an area he hasn’t even visited yet. Then, he returns to the Market using Farore’s Wind. At this point, the inner programming of the game is freaking out, thinking that he is both playing the game and at the title screen. This causes him to warp around the map every time he enters a new loading zone. This is called “wrong warping”. Exiting the Market loads him into the Shadow Temple, where he runs off to acquire the Hover Boots. After grabbing the Hover Boots, he returns to the Market using Farore’s Wind. Entering the Archery Shop loads him in front of the Temple of Time, the game still vastly confused. As he walks into the Temple of Time, he actually ends up loading back into the Temple. However, he’s standing in front of the Master Sword, and is able to pull it out. This usually requires beating the Deku Tree, a temple Ben has yet to visit. 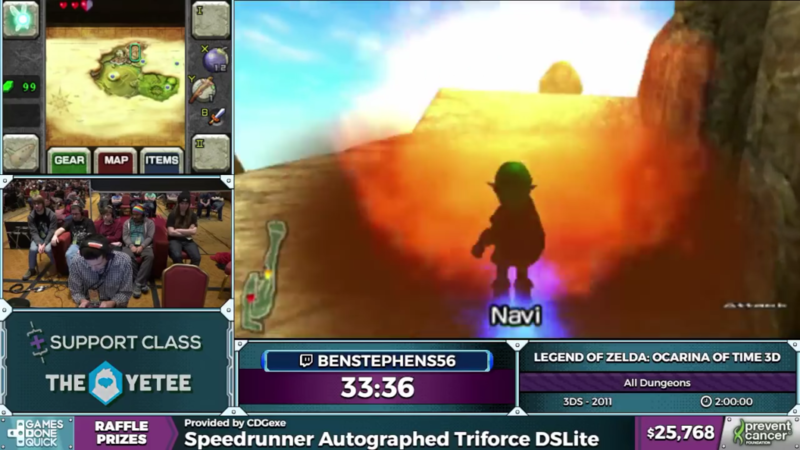 After grabbing the Hookshot from Dampe, Ben executes a HESS and travels across Hyrule Field towards the Forest Temple. The Forest Temple in this run shows off exactly how game breaking simple bugs can be. Ben sets Farore’s Wind in the first room, and then enters the dungeon proper. In the first dungeon room, he walks up a set up stairs and hugs a corner. After setting an angle, he back flips at the correct time and grabs a ledge. This pushes him out of bounds, where he is able to fall through the floor. When he loads in from falling through the floor, he’s outside of the Forest Temple boss. 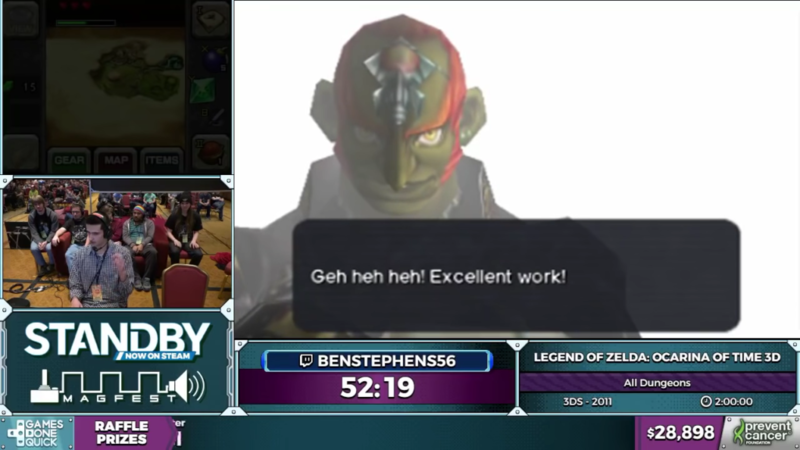 Ben takes out Phantom Ganondorf quickly, and then shows off a cut scene skip that combines “restricted items” as he enters the blue warp zone. This allows him to get the medallion, but skip the lengthy cut scene of him obtaining it. The Fire Temple doesn’t have any huge glitches, but is rather a collection of technical movement and small tricks. Ben pulls of a few, such as a mega jump using the bombs, as well as a ledge clip. The ledge clip allows him to skip an entire puzzle in a room, and looks pretty neat at the same time. A larger ledge clip comes towards the end of the dungeon though, which allows him to skip obtaining the boss key. After skipping the cut scene for the fire medallion, Ben warps back to the Temple of Time and unlocks the Boss Rush mode exclusive to 3DS. This is where he sets up for a pretty insane trick. He returns to Link’s house and uses the restricted items glitch to set a Farore’s Wind point right where he accesses the menu for Boss Rush. Then, he returns to the Forest Temple and uses the same trick to skip to the boss room. 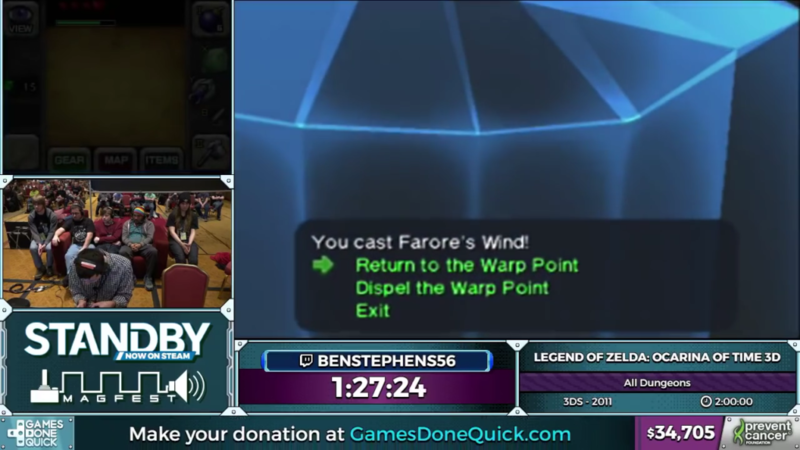 He repeats the cut scene skip, but by returning to the Farore’s Wind warp point on one single frame, he is able to confuse the game into warping him somewhere crazy. The game warps him into the opening cut scene, which is actually loaded on internal save file. This internal save file that is meant for development use, has all the items and weapons, maximum health, etc. After falling through the cutscene fourteen times (equal to the maximum number of hearts), he is able to save the file over his own file by saving and quitting. 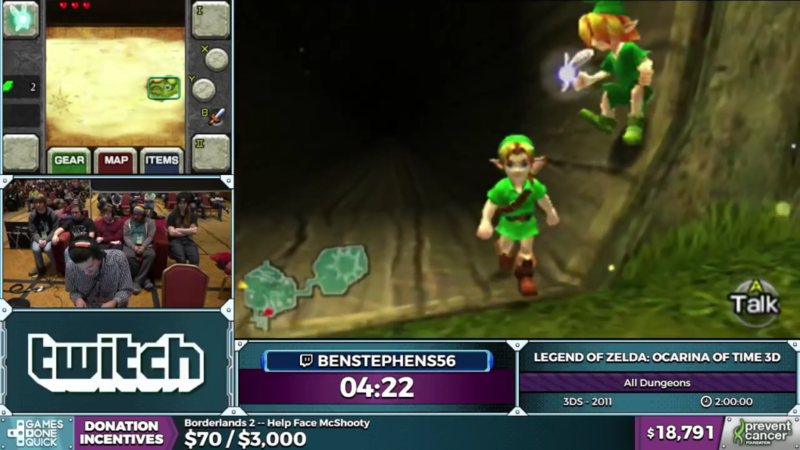 Back in Kokiri Forest, Ben is able to enter the Deku Tree as Adult Link by doing a HESS off of a roof. Combining this with the hover boots allows him to enter a partially unloaded Deku Tree area. This removes the obstacle blocking your normal entry. The Deku Tree is easily completed thanks to two hookshot jumps, the second of which shoots Link super high into the air. This allows Ben to line up his fall, and end up loading into the boss room. 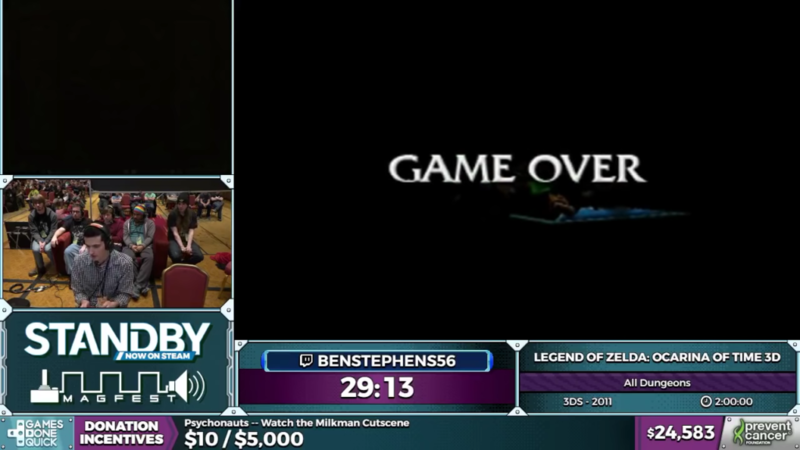 After defeating Gohma, Ben repeats the cut scene skip trick again. This time, Farore’s Wind wrong warps him to the giant stone goddess. The Spirit Temple is already shortened due to where Farore’s Wind spawns Link. Ben is able to skip half of the dungeon by hovering between the statue hands. The save file with all the items also contains eight keys in the dungeons, so Ben doesn’t have to worry about finding any. He doesn’t need many though, as he hook shot jumps out of bounds and lands in the final boss room. The Water Temple is also quickly skipped thanks to the internal save file also containing all the boss keys. By executing a quick hover trick, Ben is able to reach the boss door quickly. He does a cut scene skip again and warps back to Kokiri Forest, and heads towards the Deku Tree. By repeating the same glitches, he reaches the boss room and sets Farore’s Wind. This sets up another cool skip. Ben warps to Lake Hylia, and finds another grotto hole. 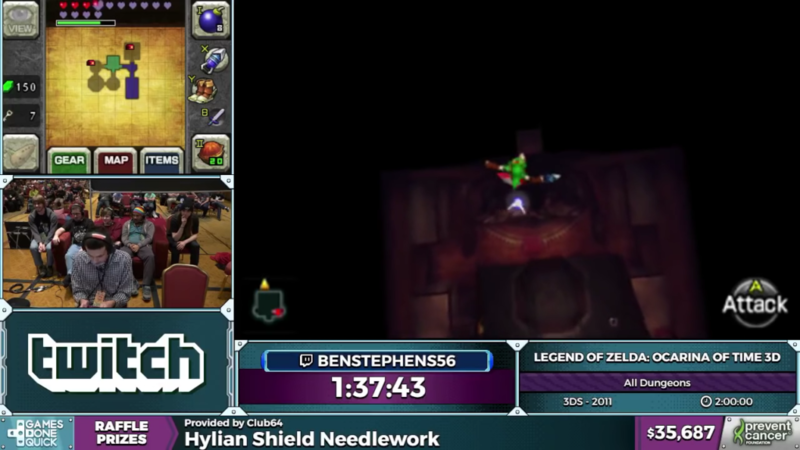 Using the same glitch that involves dying while entering a grotto, Ben is able to confuse the game and warp directly to the Bongo Bongo fight in the Shadow Temple. Hopping into the blue warp zone spawns Link in the Forest Temple, of all places. 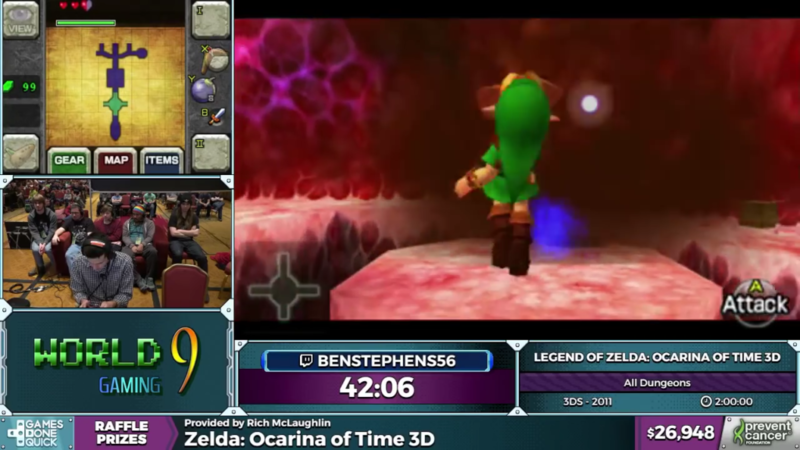 This is where Ben executes a glitch called “ocarina items”. It works by using specific items (like Farore’s Wind) on a specific frame while a bomb explodes in your hands. This causes you to play a phantom ocarina. 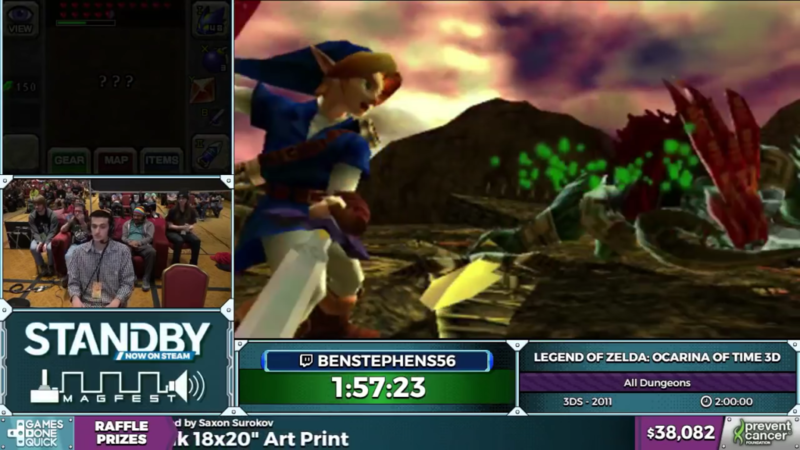 By playing the Shadow Temple theme, the Nocturne of Shadow, Ben is warped directly to the end of Ganon’s Castle. This skips the entirety of Ganon’s Trials. All that’s left is the final boss fight against Ganon, which goes off without a hitch. 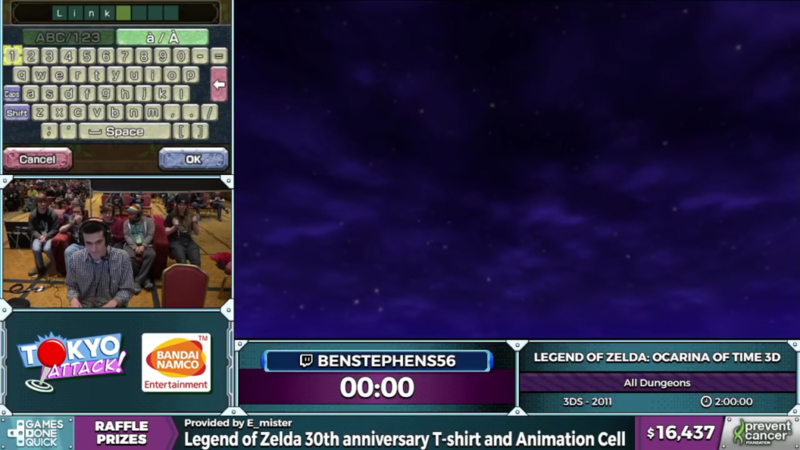 With a final slash, Ben ends the Ocarina of Time 3DS run. It was a great opportunity to explain some awesome glitches and take an extensive look at the tricks possible. 1 Hour, 57 Minutes, and 23 Seconds. Amazing write-up! I want to learn this route so badly! Thanks! It was a fun run to cover! The route itself was partially improvised. 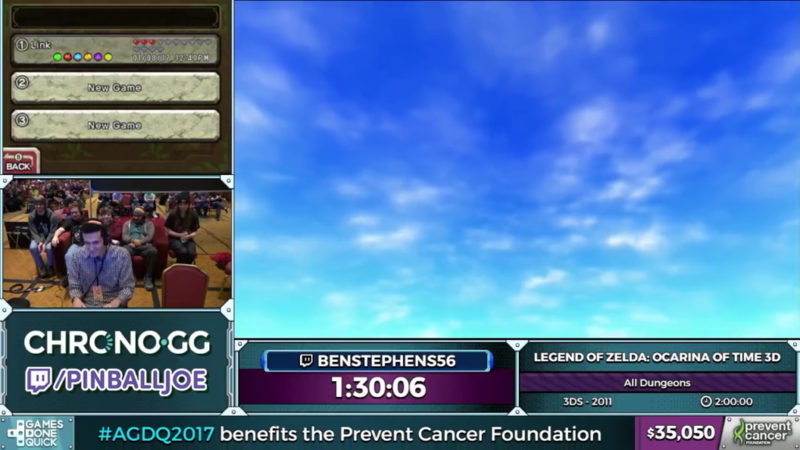 Ben actually messed up and forgot to put down a Farore’s Wind marker in the Temple of Time. So quite a bit of the run was improvised post-mistake. However, the all dungeons run for 3DS does look super awesome, but a bit difficult. I’m glad you enjoyed the coverage! Stick around for more stuff from yours truly!